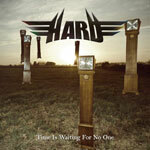 Hungarian melodic rockers HARD turned a major corner in 2008 getting major international recognition for their superb disc, Traveller. In 2010, another milestone is reached for their latest Time is Waiting for No One as they have been signed to England's Escape Music, a major league purveyor of melodic rock and metal. Additionally, noted producer Beau Hill jumped into remix several tunes for the work. But probably the most significant change was replacing their lead vocalist, J�zsef Kalap�cs, with Swedish singer Bjorn Lodin (Baltimoore). Even with his raspy versatile range, I think the verdict is still out on Lodin (and I liked the other guy, too). Nevertheless, one thing has not changed: HARD still crafts immensely infectious melodic rock bristling with melody, hooks, and fiery fret work. Some of the best songs are the title track, Magical Pretence, Lonesome Loneliness, and 4-leaf Clover. Overall, Time is Waiting for No One shows HARD firing on all cylinders and maturing as an entertaining melodic rock band. Yet, I think I like their previous release, Traveller just a bit more. Overall, Time is Waiting for No One shows HARD firing on all cylinders and maturing as an entertaining melodic rock band. Yet, I think I like their previous release, Traveller just a bit more.